Although expert elicited knowledge and data mining discovered knowledge appear to be completely opposite and competing solutions to the same problems, they are actually complementary concepts. Besides, together they maximize their individual qualities. This chapter highlights how each one profits from the other and illustrates their cooperation in existing systems developed in the medical domain. The authors have identified different types of cooperation that combine elicitation and data mining for knowledge acquisition, use expert knowledge to enact the knowledge discovery, use discovered knowledge to validate expert knowledge, and use discovered knowledge to improve the usability of an expert system. The chapter also describes their experience in combining expert and discovered knowledge in the development of a system for processing medical isokinetics data. The joint application of knowledge discovered through DM and heuristic knowledge elicited beforehand from the expert has the goal of optimizing and maximizing the performance of the resulting KBS. 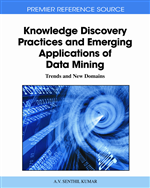 To illustrate this cooperation, cases where knowledge is acquired through both expert knowledge acquisition and data mining and where expert knowledge is applied to improve knowledge discovery is presented. Cases where DM techniques are used to aid ES development with respect to aspects like ES validation, improving system usability and efficiency or validating the local application of generic knowledge is also highlighted. This section finalizes with a summary of related work and with an enumeration of major current trends in the field of combining ES and DM.